Dog ear plugs are one of the ways owners protect canine ears that are are risk for injury from noises such as fireworks or shooting or disease. A dog ear is relatively more sensitive to sound than human ears. Its' complicated anatomy makes it difficult for owners to keep them protected against noise pollution, foreign factors and issues related to behavior. Dogs with floppy ears require extra care as well as those dogs which remain mostly outside. Similarly, hunting dogs and those which are frequently exposed to water should get their ears protected. There are several options for protecting dog ears; some are conventional, but there are alternative approaches such as natural remedies and mechanical methods such as dog ear plugs. A common use for outside the ear protection is for dogs that frequently travel via plane or that experience anxiety when exposed to certain noises such as fireworks, construction, lawn equipment or other barking dogs. In ear dog ear plugs are relatively risky and dangerous for pets, therefore they are not usually available commercially. In our opinion, these should not be used by owners, Veterinarians do use these plugs during clinical procedures but only in cases where there is no alternative available. Over the Ear Dog Ear Plugs Are Comfortable and Provide Full Noise Spectrum Reduction. 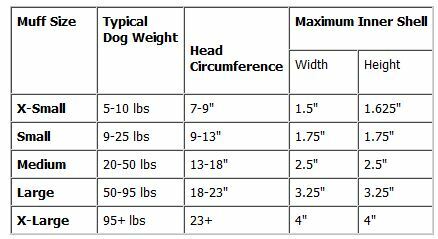 They are sized according to the chart shown below. There are various ways to protect dog ears against several risks. The most effective way is to train the dog for life in different environments and conditions. Similarly, preventive measures are another way to reduce the chance of dog ear problems related to environment and pathological factors. Protecting dog ears with plugs is a relatively modern way to protect the ears. This method is effective but there are several issues related with this dog ear protection method, as this is a mechanical way of protection. Dog ear plugs are most effective and helpful for those dogs which are fond of water and/or have to travel by air. Canine ear plugs are designed to reduce the amount of noise that enters the ear and to reduce the change that external agents such as water enters into the ears. This is done by blocking the external part of the ear. Now a days, there are two different types of dog ear plugs commercially available, which are either placed outside the ear over the head or are a plug which is kept deep in the dog ears. Research has shown that dog ear plugs which are placed outside the ear over the head are safe and can be adjusted easily, without causing any threat to the inner parts of the ear. 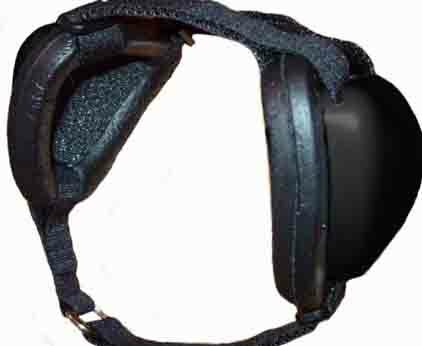 One popular brand of over the head dog ear plugs are Mutt Muffs Hearing Protection for Dogs. There are several behavioral issues related with this the in ear method of ear protection,even though rubber or metallic canine ear plugs can help in the prevention of problems. If these are used repeatedly and for a long period of time, the alertness and active nature of a dog can be badly affected, which surely degrades the health and energy status of a dog. In ear plugs are not recommended as they put the sensitive inner parts of a dog's ear at risk if inserted to far or improperly. It is for this reason that these types of plus are not commercially available. Veterinarians will use this type of plug in the office when a veterinary approach demands their use and when another approach is not available. 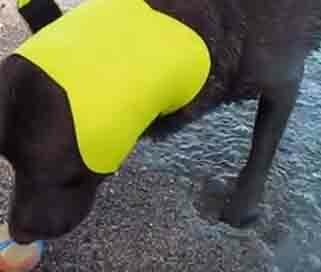 To the best of our knowledge, there is one dog ear protection product for swimming. The product is called AquaBandit and it wraps around the ears to help prevent water from entering the ear canal. The product is made out of Neoprene and seals over the ear canal. Neoprene "smooth skin" design seals the ear canal. Velcro is adjustable for fit. Helps to prevent ear infection. Pathological Risks: The environment contains a number of pathological agents (disease causing), which can lead to various health issues, including those related to ears. Bacteria, parasites, fungus and allergen exist everywhere, thus dogs which roam around or remain outside most of the time are exposed to these health risks. Working dogs, playful breeds, hunting dogs and some companion pets housed outside the home are some examples of such dogs. If these dogs are not protected against pathological factors with vaccinations, preventive measures and routine care and grooming they may develop severe health problems, including those related to the ears. Also, dogs which are attracted to water and damp places are more at risk, for the reason that moisture can cause enhanced microbial growth in the ears. Behavioral/Psychological Risks: Pathological risks are more probable, but recent research has proven that dogs kept outside the home may develop behavioral problems as well. Dog ears are meant to help dogs react to different sounds that pour into the ears, which is why the position of a dog's ear is related to their level of activity, alertness and response. Dogs exposed to noise or who experience sudden loudness may develop non infectious ear problems and certain behavioral problems as well. Hunting dogs are the best example, who may develop ear problems due to gun shot noise. Dog ear protection or plugs can also help a dog that reacts to or that experiences anxiety to noise such as lawn mowers, fireworks, other dogs, lawn and garden equipment, etc. Training techniques such as providing a positive reinforcement when there is a negative noise can also help. This is a conventional, but most effective and proven approach to provide a level of dog ear protection. Different natural products can be used for several purposes, related to the canine ear. For example, product such as Ear Dr. can help to strengthen ear health, help to protect against disease and reduce symptoms when an ear problem does occur. Products as mineral oil can keep a dog ear dry and protected against water. Similarly, garlic, vinegar, oils and vitamin E can protect dog ears against infections and parasitic activity if used regularly for ear cleaning purposes. One dog ear home remedy is to use 4 cloves of garlic soaked in olive oil overnight. Strain out the garlic in the morning. Warm the oil to the touch and then use an ear dropper to place several drops in each ear. DO NOT insert the dropper into the ear canal to avoid puncturing the ear drum. Some other natural products such as PetCalm Formula use ingredients such as Arg-nit and Passim Flora to help keep nervous system balance in animals, especially those that are exposed to a noisy environment.